Last November, I was in Greece for a couple of weeks to set up a Meeting Place for Samaritan’s Purse in the Galatsi Transit Camp for refugees, located just outside Athens. The idea was to set up an outreach tent within the camp, which would provide a social space for refugees to hang out over tea and coffee. We also provided free Internet and charging stations for cellphones. We had Dari-speaking and Arabic-speaking staff members present who would serve and chat with the Afghan, Syrian, Iraqi, and other refugees and try to provide them with information about their journey and destination countries. 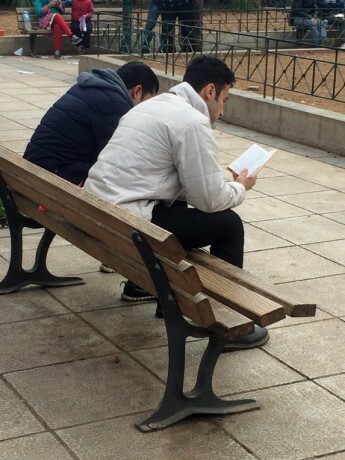 At the same time, our workers also looked for opportunities to share the Gospel with the refugees. Thousands heard the Good News and hundreds were prayed for and received Bibles and other Christian literature in their own languages. Several dozen made commitments to follow Isa—Jesus Christ. Our Meeting Place staff members, most of whom were seasoned workers who served in Muslim countries in the past, were astonished to see how open people were to the Gospel. Many were thirsty to hear more about Jesus Christ and what faith in Him meant. Earlier this year, Galatsi camp closed down, and restarting the outreach in other camps around Athens or in transit camps in the Greek islands proved to be difficult. 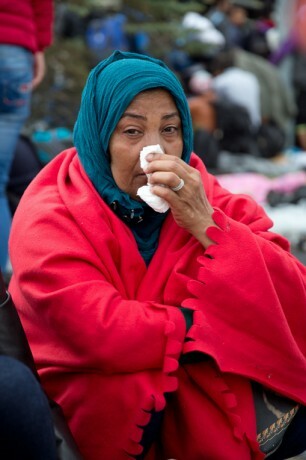 More restrictions had come into effect, and several evangelical groups were actually told by the Greek authorities to cease visiting the camps and conducting “proselytizing” activities. Given the new restrictions, our team took the strategic decision to rent an Internet café near a square in central Athens that had become sort of an informal hub for the refugees. This new Meeting Place would allow us to provide better services to the refugees (with the potential to add laundry, day care, and English class services on top of the free Internet and coffee/tea), and maintain a more permanent presence in the city.  We’re currently in the process of acquiring our license and would value your prayers so that this new rented facility can begin to function shortly. While waiting for the license process to begin, our small team has been able to support our broader relief effort on Chios Island. 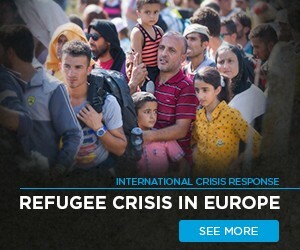 Samaritan’s Purse has been operating in Greece since the refugee crisis began last fall, collaborating with the U.N. and other aid agencies in managing migrant transit camps on the five key islands to which most refugees arrive by crossing on tattered boats and rubber dinghies from Turkey. When our team arrived on Chios, they began working 10-hour shifts in two camps. While not allowed to hand out any Bibles or Christian literature, we have had many opportunities to discreetly and gently share something about Jesus, talk about our faith, and pray for people’s safety and their future as they journey toward what they hope will be a better life. 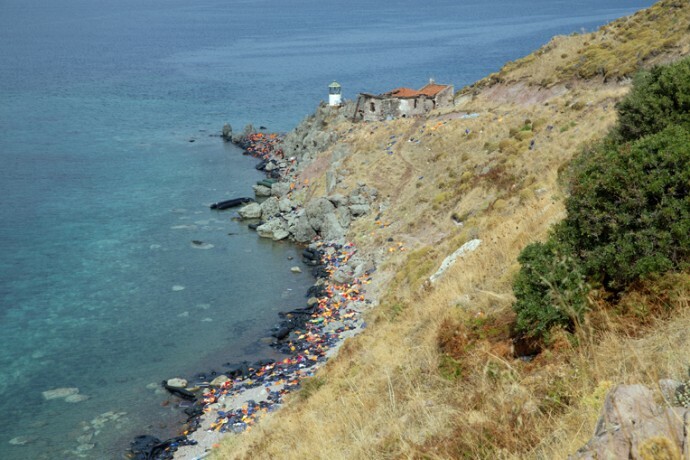 Life jackets and rubber dinghies scatter the coast of Lesbos Island in Greece. Recently, a 2-year-old Afghan boy was trampled to death in a dinghy that made the perilous night journey from Turkey. Our Dari-speaking staff worker, Heather, was able to comfort and pray with the grieving mother and even take her out on a walk and share about God’s peace and presence in times of loss. The mother asked Heather to stay and bless the child’s grave when the funeral takes place. The number of refugees arriving on the island is rising again as the weather improves and, with it, the number of accidents and deaths. It’s reported that 365 migrants crossing the Aegean from Turkey died or went missing in January. Refugees are willing to take this risk and pay Turkish smugglers up to 1,000 euros per person to escape barrel bombings, brutal conflicts, and displacement back home to find some peace in Europe. I came across a group of evangelical Syrians from the battered city of Aleppo. They had tried to settle in Turkey but found that as Christians it was difficult for them to find work or practice their faith. They decided to risk the journey to Finland, where they had an old Christian contact. They were now standing in line with hundreds of other refugees waiting to get registered, tired and confused, wrapped in blankets with nothing but packs on their backs—their sole possessions in the entire world. I prayed with them but couldn’t hide the tears that fell from my eyes. Back in November, Donna, one of our Dari-speaking staff, shared with us an incredible incident. It isn’t often that one working with Muslims gets to see a seed planted become harvest. Usually, one person plants, many more water and tend, and later someone else gets to harvest. Salma left her home in Iraq in search of a “normal life.” She believes that nothing could fix the destruction that’s happened in her country. But that blessing was given to Donna in Galatsi camp in Athens just before it closed. Nine years ago, while she was still living in Kabul, Afghanistan, she had trained a poor woman to become a house cleaner. Sometime later, that woman’s father died, and wanting to support the lady emotionally, Donna trekked to the home of the lady’s sister, where the funeral was held. They sat and cried together, and Donna prayed for the sisters. The family was poor and illiterate, but Donna knew some of the children went to school, so she left a Dari Bible and told them to read it to their families to receive comfort. In the years that followed, the sister loved Jesus and Mohammad and considered them both equal. War intensified and her life was made more difficult when her husband died from a heart condition. The sister finally decided to leave war-torn Afghanistan with her three young boys and her sister’s 18-year-old son to seek safety in Europe. That week in November, while working at the camp, Donna prayed for that same woman, not knowing who she was. But the next day the woman sought Donna out in the Meeting Place and asked her whether she had ever lived in Kabul. When Donna replied that she had, the Afghan woman then asked Donna if she had trained her sister. 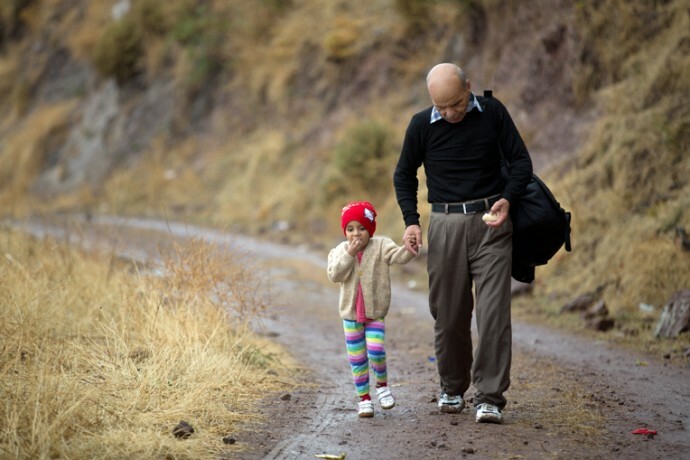 A man walks across Lesbos Island, Greece, with his granddaughter. Along the way, they received bananas and water from Samaritan’s Purse. Donna prayed with her again at the camp and then explained why she prayed in Jesus’ name. The woman said she believed in Jesus and that her brother had read the Bible Donna left with them to the family. But it was clear she didn’t understand that Jesus was God. After Donna explained who Jesus was, what He has done for us, and how we have assurance of salvation if we pray to receive His gift and confess who He is, the woman asked if Donna would help her pray that prayer. This Afghan woman now confesses Jesus as Lord. She understands that the Holy Spirit will go with her to guide her, that she can cry out to God from anywhere, and that He hears her prayers. Donna said it was such a blessing to see immediate transformation in her face and eyes as the peace of God came over her. While the refugee crisis continues to be viewed by many in Europe as a major problem, from the perspective of the Kingdom, this crisis is clearly God’s opportunity for the church in Europe. An average of 2,000 migrants a day landed on Greek shores in February, and this number is expected to rise in the spring. Most are refugees fleeing relentless wars in their own lands. Many say they want their children to experience, for once, life away from the constant shelling, sniping, fighting, and the unrelenting savagery of war. We speak to many individuals who have been disillusioned not only by their despotic leaders but also with the excesses of Sharia law, intolerance, and violence. That violent seed is now metastasizing and disfiguring countries from Syria to Somalia, from Iraq to Palestine, and from Afghanistan to Libya. Removed from the heavy grips of their communities and their imams, these individuals now express a genuine interest in the Christian faith, an astounding openness to the Gospel, and, above everything else, deep curiosity and admiration for the person and power of Jesus Christ—Isa el Masih. Before us lies an opportunity of a generation. For decades, our churches struggled to find and send missionaries to these closed and dangerous lands of the Middle East and Central Asia. The task of sharing the Gospel, planting churches, and bringing people to a living relationship with the Lord Jesus Christ in these places proved even harder. Now the fields of harvest are literally walking onto our shores, and they are ripe. Let us pray that the church rises up to the occasion. History shows that the church is revived and blessed when it looks outside of itself and mobilizes around such historic opportunities.